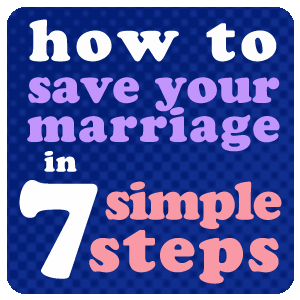 The proceeding 7 simple steps to saving your marriage are pulled directly from my book, "The Divorce Remedy." I've summarized the points to help get the wheels turning in your efforts to save your marriage. Buddhists believe that people should approach their lives with a beginner’s mind because in a beginner’s mind there are many possibilities, in an expert’s mind, there are but a few. To be a creative problem-solver, it is essential that you empty out your expert mind about love and marriage because it will only blind you to possibilities. Successful people know that having a vision of your desired outcome is the most essential step to making positive changes. Write down your relationship goals. Make sure your goals are positively stated- requests rather than complaints, action-oriented-“When you make eye contact, I feel that you’re listening,” and broken down into small, do-able steps- things you can accomplish in a week or so. Once you identify your goals, lovingly ask for what you want. Complaining or nagging doesn’t count. Neither does defending yourself. Just calmly state your request. Your spouse may not be listening, so proceed to the next step. Do you have arguments where you say and do the same things every time the disagreement pops up? You’ve got to quit doing more of the same. Even if you think you’re right, you’re not solving anything and you’re bringing out the worst in your spouse. If what you’re doing isn’t working, DO SOMETHING DIFFERENT! Anything different will kick your marriage out of automatic pilot and yield a new and better response from your spouse. Experiment by doing something you’ve never done before and closely watch your spouse’s reaction. See how far you’ve come. Ask yourself, “ On a 1 to 10 scale, how would you rate your marriage prior to using The Divorce Remedy?” "Where on the scale would you say you are right now?" "Are you satisfied?" "If not, where on the scale would you need to be in order to feel satisfied?" "What might be one or two things you could do that would bring my marriage up a half step on that scale?" If things are better, it’s not due to magic. You took some very specific actions to achieve those goals. If you want to maintain your changes, you have to keep doing what has been working. Make a list of what you’re doing that works and make sure you keep it up!